The "Narratorial Creators" Series is a space for radically creative teastained women to share ideas that inform their work and the resolutions they have for its impact on the world. My hope is that their offerings inspire us to Journey Soulfully, thinking differently about our humanity and creative continuance as we see what other stories are possible for us to tell with our gifts along the journey. When I first encountered Dina's ceramics on my personal Instagram I was blown away by the dreamy forms. I was also ecstatic to see another teastained woman interpreting her narrative and reclaiming her history, ancestry, and self-discoveries through clay (see my NC interview with ceramicist Marika Yeo). Lead by my voracious curiosity about teastained women's creativity and without any formal introduction I quite abruptly requested an interview with Dina-to which she ebulliently obliged. I am so excited for this woman's journey and for what she is en route to unearthing (literally, eh?) about herself as she expands her tactile dialogue with clay and deepens her understanding of her roots. and creates out of her studio in California. Growing up around the Somali and Sudanese traditions of her parents, ceramics were a part of everyday life and conveyed the daily rituals of life along the Sahara desert. 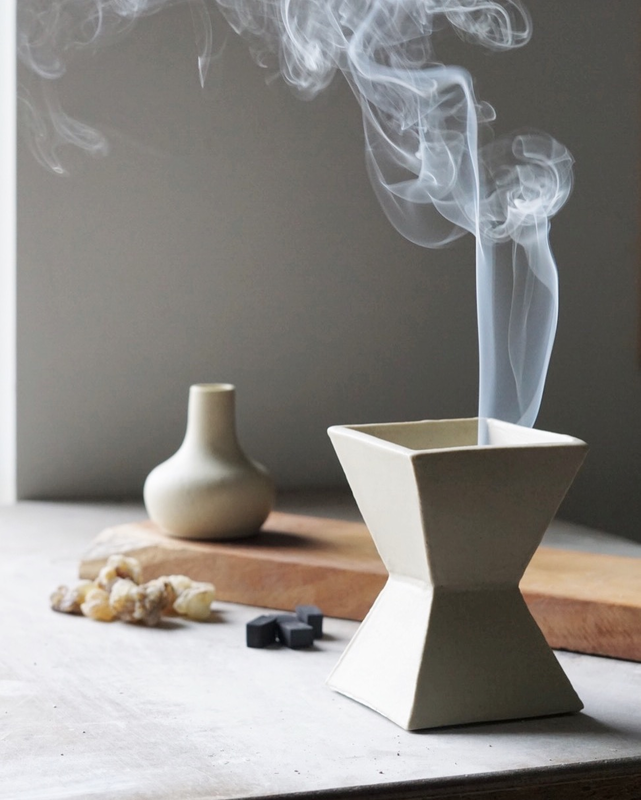 Some of her earliest memories of ceramics were of her grandmother burning frankincense and sandalwood in mabkhars, and clay amphoras known as zir placed outside of homes, providing water for travelers. 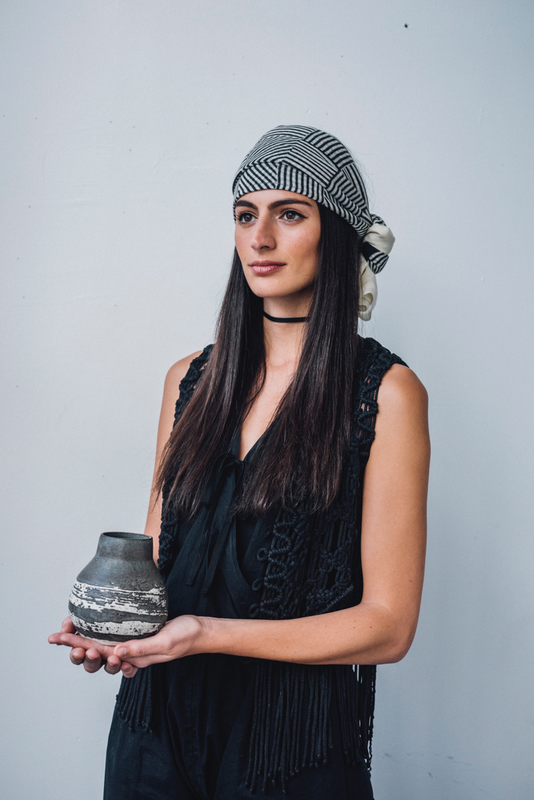 Dina’s personal journey with the ceramic arts is also a path to reconnecting with the indigenous culture of her homeland, as the Nubians of North Sudan and Southern Egypt were among the most legendary potters of the ancient world. Your childhood interactions with ceramics were not very ostentatious at all...they were more or less everyday, anthropological, etc. When did you start seeing clay objects as artifacts of a deeper, richer cultural narrative? While I was studying the politics, history, and culture of Africa and the Middle East in college, I took a course in African Art History that had a very deep impact on me. I learned that artifacts that we today considered traditional African art were actually functional pieces that were an integral part of these societies’ operations. There were of course certain ceremonial or sacred items that were reserved for particular rites or times of the year, but even then, they too served a function. We can learn so much about the soci-political structures and traditions of pre-colonial Africa through the artifacts they left behind. After that realization, I started to see the ceramics of my childhood as remnants of my indigenous cultural heritage that had survived cultural colonization. It’s amazing that you’d say this. The other day I was watching African Civilizations on PBS and one of the contributors was talking about the Lalibela Churches...she said that these were more than sculptures because they had sacred as well as everyday functions. It got me to thinking about how our work in Africa is artefact in that it gives us as descendants an idea of what once was and its value but also how we don’t come from making work that is NOT functional. In your opinion, how can an artist make work (not just ceramics) that is artifact for the next generations, functional in the present tense, and that survives the times? What is that mindset? I think that we all have a human impulse to leave behind a legacy, which in today’s context can at times seem self-involved. However, legacy within the context of lineage is different in my opinion. The legacies that people leave behind in societies with traditions of passed down skills were focused on transferring generationally accumulated knowledge, and less concerned about recognition. I don’t know if there is a way for an artist to consciously create art that will be artifact for the next generation- it seems like that is a distinction that is made after the fact. We value these artifacts because of their beauty, but also because they are the only tangible remnants of the passed down lineages through which they were created. I think focusing on preserving techniques and skills in conjunction with preserving the pieces themselves may be a greater approach than creating with the intention of leaving behind a legacy. Would you share some insights you have gleaned thus far on the power of ancestry, heritage, and generational interactions? I think one of the most inspiring pieces of information I came across recently was an article on a group of scientists who discovered that traumatic events are passed down through our DNA. I truly believe that we not only pass down our traumas but our skills and knowledge as well, and that we have the ability to access this information. More than once while creating forms in clay, I have experienced my hands moving without much of a plan, and creating an unexpected new form. Several weeks later, I would come across an ancient Nubian or Somali shape that was almost an exact replica of what I had created. It could have been influenced by an image I came across sometime in the past that was stored in my subconscious, but I like to think otherwise. CULTURAL freaking MEMORY!!!! I interviewed Juliana Luna a little while back and she described something equivalent to what you’ve described here! I’ve also met other artists who say they approach their art with no agenda and the product ends up resembling something cognate in their bloodline. So...how to say this. Have you had to keep yourself from being “taught” too much so that this naïvete, this channel of communication between your ancestry and your hands stays open? Do you believe we can be “educated” out of this connection with cultural memory if we obey too much critique or are concerned with following market trends, etc.? Everyone wants their art to be unique, and, simultaneously, there is pressure around credentials and validation through socially acceptable means of valuation, such as degrees and apprenticeships. I’m not dismissing their importance, however, we should not judge a person’s abilities solely through these means. For instance, my glaze chemistry teacher is absolutely brilliant and has been studying and teaching glaze chemistry for over 20 years and ceramics in general for 40. She was denied teaching a class at a local college because she never earned an M.F.A in Ceramics. Unique art that also speaks to people doesn’t necessarily come from being trained in one specific style and creating within an established framework. My journey has been a lot more unconventional. When I first became interested in ceramics, I took three months of a weekly wheel throwing class. Shortly after, I moved to California from New York and was lucky enough to have a space to set up a small studio of my own, where I developed my skills and knowledge by exploring different techniques and researching ancient ceramics. I then took a glaze chemistry class, and went back to the studio, did more research and made my own glazes. I would have moments when I would come across a style that I really loved and would make a piece with that style in mind, and it just wouldn’t feel natural to me. I would always just end up going back to creating whatever was coming through me. Now, when I see something I like that another ceramic artist is doing, I appreciate it because it is an expression that came naturally through them. I think that one’s art is always going to reflect one’s personal journey. In my experience, in order to create from that place of cultural memory, you have to be willing to do some of your own self-work and have your art become a vehicle for that self-discovery, or really recovery in this case. The more you get to know yourself, the clearer that channel of communication between ancestry and your hands becomes. You have to be willing to unlearn previously held beliefs about yourself, your art, and your environment. It’s a vulnerable process and it can be incredibly challenging at times when your art is also the platform that challenges such fundamental parts of your identity. However, once you start on that journey, that channel of communication becomes clearer and clearer over time. When I first encountered your work my first impression was “dreamy”. What are the emotions, sensations, and ideas about life that you want to evoke with your ceramics? When I design a piece, there is of course an aesthetic element, but underneath that I also focus on how the piece makes me feel. The only way I can really explain it is that the piece must brings me a sense of pleasure and satisfaction. Many forms of art around the world have a name for a feeling that you receive, for instance, from listening to an exceptional piece of music; Portuguese has saudade and Arabic, tarab. I have yet to find a word for this in ceramics, but I like to think of it as feeling an element of the divine. Not that I would ever claim that my art is ‘divine’ in the traditional sense, but what I mean is that I design with this feeling guiding me. …”Duende” in Spanish and “Hyggelig” in Danish… Is this indescribable feeling of eudaemonia an indicator for when a piece is done? Does it always come right away? And what does it mean for you when it takes longer than anticipated to surface? The feeling that guides me is so intangible and subtle, therefore it comes and goes throughout the process of making. When I’m analyzing a piece at each stage of the process, I can look at it and see if I receive a feeling of pleasure and satisfaction from it. At the same time, there has to be a sense of letting go, especially during the glazing process. In that stage, the maker’s hands take over and I relinquish control. I don’t fret over the perfection of my glaze application and I let my hands guide me to create beautifully imperfect details. I love the juxtaposition of clean forms and rough glazes. I would say that a lot of the time the finished product is different in some way from my initial intention. I think that’s a natural part of creating ‘in the zone’. Your mind might have an idea, but your hands know better. Most of the time, the end result is better than what I had anticipated. If it takes an idea a little longer to manifest itself in the clay, it usually means I am trying to emulate something and that I need to listen to how the clay wants to be shaped, and not what I think it should look like. When this is the way you naturally create, it can be challenging to be in production mode and create multiples of the same thing. My personal relationship with my art is that I treat it like a practice. It’s a space in which many areas of my personal development are intertwined. It is a platform where I am invited to work in a kind of meditation when creating with clay. more about being a creator and curator of an experience. which is important in my opinion. Do you believe Black/Brown women have a distinct relationship with clay? How and why? I think that all women have a unique relationship with clay. Pottery is indigenous to pretty much every culture and, traditionally, women were the potters. An example specific to West Africa is from the book Mande Potters and Leather Workers: Art and Heritage in West Africa by Barbara E. Frank where she notes that in the tradition of the Mande, the women were the potters while the men the blacksmiths. There are also some very interesting ideas that are being challenged around gender bias in ancient pottery. Marla C. Berns published an article called “Art, History, and Gender: Women and Clay in West Africa” in the African Archaeological Review in which she notes that although women produce the majority of pottery in Africa, it is still assumed by many scholars that men were the makers of figurative ceramic artifacts found in archeological sites. It brings awareness to society’s gender biases when it comes to what she calls ‘high art’ versus ‘low craft’. What does your name mean? Has its meaning informed your life’s journey in any way? which is also my middle name. In our tradition we take on our father’s first name to indicate lineage. to her maiden name ‘Abd El Nur’, or ‘servant of the light’. and, the darkness, that which we have yet to know. It also symbolizes the concept that through darkness there is always light. To me, it is a reminder that we evolve through our discomforts. What is a recent discomfort you’ve had to evolve through and what did you take from it as a final lesson about the journey? I decided to leave my job of 7 years in New York City, which was a very hard thing to do. I was working in development at a highly esteemed organization and started working there first as an intern my Senior year of college, so I was there for the majority of my 20s. My family was supportive, but they were also concerned. I come from a family of high-achieving academics and doctors, so making that choice was very unorthodox. At the time, all I knew was that I needed something different. I had this very lucid moment where I could see two distinctly different life paths that were in front of me, and I just kept having this message in my mind that everything worth having takes risk. So I took a leap of faith, set up my ceramics studio and kept following this calling that I felt. Can you talk more about what that “calling” feels like? I know so many women out there who 1. Don’t recognize that feeling and 2. Don’t know how to respond to it. There’s seldom someone in your circle/proximity who can mentor you through life beckoning you into the unknown. What are some indications you noticed in your life just before you took that leap? What was the feeling of that “leap of faith”? And how did it feel the moment you landed on the other side, in that unknown, but knowing you were where your gut/soul had been calling you? When I find myself in conversation about this subject, many people say, “I could never do that because it would mean that my life would completely change.” What they don’t realize is that the point of pursuing what Joseph Campbell calls ‘your bliss’ is to come out the other side changed. That path is difficult, but if you decide to go on it, you will uncover more about yourself than you thought possible and create a life that is in line with what you desire. When I started to feel that calling, it didn’t come in one felt swoop or in a distinct message. Rather, it happened gradually over time, and it would have been easy for me to miss the signs had I not been listening for them. The process of listening is really what is important, because that feeling or voice that is trying to guide you can feel really faint at first, almost like a passing thought that can easily be ignored. The trick is to follow it and explore it, even if you don’t feel like there is a point to it at first. When it came to me, I woke up one morning and inexplicably had ceramics on my mind. I had never given ceramics much thought, but a few weeks went by and the thought was still lingering in the back of my mind. I decided to look into some classes and registered for a ceramics course, and two years later I launched my own line of ceramics. Apart from ceramics, can you briefly talk about the work that goes into staying true to your personal mission in ceramics and making sure that it’s evident in your ceramics? For instance, are there narratives you must rehash, books you must read, places you must travel, memories you must keep fresh? So many things! I have to always remind myself that I have to start somewhere and to not judge where I am versus where I would like to be. My vision for the near future is to go to Sudan and find a teacher from whom I can learn traditional methods of making large storage amphoras. What can be challenging is that my interest in ceramics also overspills into other African pottery traditions and I sometimes wonder if defining my work so specifically might limit me in the future. Unfortunately, there aren’t many resources on traditional African pottery methods in general. There is one great video made by a Peace Corps volunteer on women potters in Burkina Faso, Ghana, and Nigeria that I came across that is incredible and I would like to learn those techniques as well. Although I have yet to find resources on the traditions and rituals of Nubian and Somali ceramics, if you believe in the theory of multiple discovery, there is a lot we can learn through studying other better-preserved pottery traditions. For instance, there is a great book by Stephen Trimble called Talking With the Clay: The Art of Pueblo Pottery from which I learned about the subtle art of ‘listening’ to the clay and building a relationship with it. It’s a concept that I was already experiencing and it was given validation through that book. That being said, Sudanese and Somali cultures are traditions that preserve knowledge through oral tradition, so there might be a woman somewhere who at this moment holds some unrecorded knowledge. I think another factor is that I can’t remove myself from the equation. Growing up outside of my respective cultures, I have many other influences, which is evident in the modern aesthetic and styling of my work. I find that my cultural heritage informs my art but does not define it. Are you daunted by these tasks of reconnecting your medium to its origins while still crafting your own voice? What, in your opinion, is the role of an artist as yourself in our society--what are people with heavy (self-assigned) mantles such as yourself meant to speak to the world/ what’s your role? One of the most liberating things I was told by my father, who is a huge influence in my life when it comes to ancient African art and history, is that culture is never stagnant and is always evolving. We can be traditionalists and point fingers when we think someone isn’t falling in line with our ideas of cultural preservation, or we can accept the mutable nature of culture. Keeping this point of view along with being clear that I am not on a singular mission to represent, replicate, and emulate these ancient ceramics helps me not feel daunted or feel like there is a heavy mantle tied to my work. and shop her ceramics on her website!